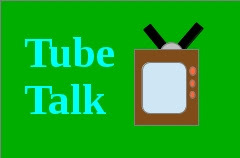 "Tube Talk" is an opinion based, bi-weekly blog about what is going on in the world of Television. We're a little more than a month away from the premiere of the new fall lineup by the four major networks. Honestly, this should excite me more than it depresses me. I was eyeing the respective websites of the big four and there were not many surprises. A lot of the "New" programming that has been posted are just rehashes or stale ideas. I could not even scroll half way down these pages without being bumrushed by; family sitcoms, crime dramas, and work place dramas. It's just the same types of shows they've been airing for decades and there is not much of a chance that one of these will be a surprise twist on their genres like "Southland" or "Raising Hope". But there is a little bit of hope in this long list of recycled material. There are three shows that I'm looking forward to. Dracula: Does there really need to be another adaption of Bram Stoker's classic story of Dracula? Hell no. Is it amazing that Jonathon Rhys Meyers is going to be playing him? Hell yeah. I haven't seen any footage from the show, but the screenshots look very promising. Now if we can only get tv shows about "The Wolfman" and "Frankenstein" and we would have a really good friday night. Sleepy Hollow: I saw a commercial for this a couple weeks back and I have to say that it did intrigue me. This isn't the most anticipated show on this list, but it's sadly the only new show from "FOX" that even remotely interests me. All it is is a crime drama that involves the story of "Sleepy hollow", as well as taking place in the present day. I'm a sucker for crime dramas and I have always enjoyed "Sleepy Hollow". I just hope it turns out well. Agents Of Shield: Do I even need to explain why I'm excited for this one? It's a tv version of "The Avengers". I get the chance to revisit this universe every week. For free? All I have to do is tune the channel to "ABC" once a week? Fair trade. The Emmy Nominations were announced a couple of weeks ago. I could give my thoughts on them, but everyone else and their mother has already done that by now. How about I talk about the fact that an internet based show has nominations? Sound good? Of course you can't respond, I'll be done writing by the time you read it. "House Of Cards" was the smash hit of the beginning of they year that "Netflix" hoped it would be. It brought a sense of legitimacy to digital distribution that it desperately needed. This is a show that has gotten praise from both audiences and critics. I didn't start watching until a couple months after it came out. I still think that this happens to be one of the best dramas in the last decade. It is a well rounded show when it comes to; the director, the actors, and the writer. All aspects are simply perfect. It is no wonder why this has garnered multiple emmy nominations. Usually, a show this well received wouldn't be expected to get award nominations, but this show is different. A lot of people were surprised that it got nominated. Not because these people didn't agree with the choice, but because it is not technically a television show. "House Of Cards" has never been broadcast over a television network, cable or not. The entire run of the show was shown over "Netflix" instant. The only other way to view it is to purchase the dvd/blu-ray boxset. I honestly hope that this opens up a can of worms for digitally distributed media. There are a lot of shows that are made and distributed on the internet that are great pieces of work. Hopefully they can be recognized more now that shows don't need a broadcast run to be nominated for awards. Not only that, but I hope this will also hopefully show people that if you work hard and let your creativity flow, you will be rewarded for it. I think we can all agree that entertainment isn't a necessity in life. It's more of a want, rather than a need. It is normally something that people use to wined down after a hard day of work, or just something to help fight off boredom. But do people treat it as a want or do they turn it into a need? A lot of people now adays would probably admit that they wouldn't know what to do without internet or cable. Even though these are not things people need to live, most have integrated it into their every day lives. The problem with this is the fact that these services come at a high cost. Even the lowest of cable and satellite packages are quite expensive. Is the enjoyment entertainment worth the cost you pay to get it? Even if you don't use cable and just rely on services such as ; "Netflix" or "Hulu" you need to pay two costs to use them. You need to pay a monthly internet bill, along with the bill for the services themselves. That doesn't include any overage charges you may receive from exceeding your internet limit. I'm not trying to dismiss these services or anyone that uses them. I enjoy streaming television shows on regular basis. I'm just not certain weather the ends justify the means. Even if you want to go the alternative route, then you can still feel bogged down by the cost of it all. Watching television using an antenna isn't as simple as it used to be. Back in the day, you used to just be able to buy a cheap antenna, hook it up, and start watching. Now adays you have to get a converter box to even use an antenna. These cost somewhere from forty to fifty dollars, plus the cost on an antenna. If you don't live near broadcasting stations, then the cost is not worth the end result. Even though I do enjoy being entertained, it does make me wonder if the cost is worth it all. But I try not to think about most of the time. Can my hard earned money go to a better place? Probably. Will me or anyone else stop spending money on entertainment? Probably not. A few weeks ago the third season of the crime drama "The Killing" premiered on "AMC". I want to give my thoughts on the season so far, but first I want to talk about my experience with the first two seasons of the show. Let's begin. 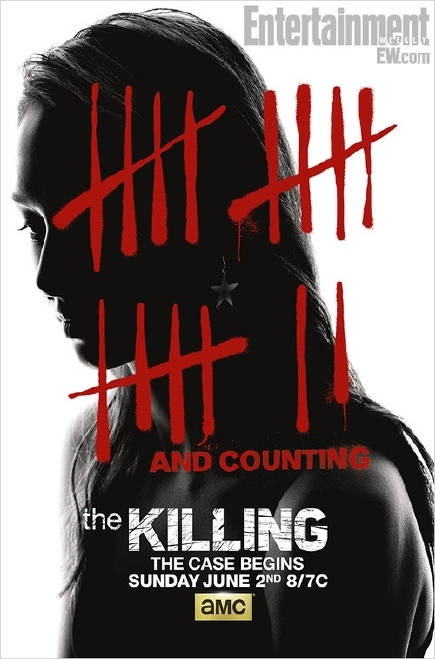 In the beginning of 2011 I was intrigued by the advertisements for a new show called "The Killing". I've always been interested in crime dramas and I couldn't pass this one up. I remember watching the first few episode, then dropping shortly after. I enjoyed the high concept and David Fincher-esque execution, but I had other things going on in my life at the time couldn't find time to sit down and watch it. A year later, right before season two was about to premiere, I saw my chance to get back into it. Luckily for me, the entire first season was on "Netflix" by that point. I streamed the entire first season over the course of a week. it had become almost like an addiction, trying to figure out who killed "Rosie Larsen". As I got more into the meat of the show I realized that the mystery wasn't the only enjoyable part. The well rounded characters in this show are so much fun to watch. Just seeing their interactions with one another could the show, even without the use of the murder mystery. This statement was tested during an episode which only contained those character interactions of which I speak. Season 2 proved to be just as good. Both with the mystery and the character development. I was glued to my tv every Sunday night, waiting for the curtain to be pulled and the answers to be revealed. Little did I know, the answers that I got weren't going to be the ones that I wanted. When it came time for the final episode of the second season, I had high expectations. Anticipation was very high and I just couldn't wait for the conclusion. When it finally happened, my jaw literally dropped. I couldn't believe that anything could honestly be as bad as this episode. I had lost faith in the show and didn't think I would be watching it again. A year later, ads for the third season began to run on tv. As the weeks went by I saw myself actually start to get excited about this. I'm not sure exactly why. It might have been because I had no other shows to follow or the hopes that this season could tie things up a bit better. Just A few weeks ago, I got my answer. The new season had shown it's mug and it wasn't so ugly. I instantly found myself to be invested back into the characters and into the story. This might have been due to the slate more or less being wiped clean. The old case isn't discussed. Instead, a case from Sarah Lindon's past has come back to haunt her. Enough has changed, yet enough has stayed the same. We follow the detectives around, as well as a group of homeless teens, and a pair of men on death row. I've found myself caring about all of these characters, even though my time has to be swiftly divided between all of them. I have to hand it to the writers, they've done a great job in getting back into the show. It feels good to see a show that is this fresh on tv. I would recommend it to everyone, even the episode I did not care for. The first two seasons of "The Killing" are available on "Netflix" and new episodes air every Sunday night on "AMC". I just want to apologize to anyone that enjoys reading my blog. I recently got a job and haven't had the time to write much lately. I can't guarantee that I can keep up the same pace and schedule as I did before, but I will try to post as many of these as I can. Let's get started. Like I said in the opening paragraph, I've been working a lot lately. This has changed my eating schedule and sometime even what I watch. I work a lot of late nights and that causes me to watch what's on. This got me thinking; does working effect what you watch on tv? When you get home at midnight most nights, it limits your choices on tv. Most nights I honestly just watch baseball highlights. It's colorful, fast paced, and allows to turn my brain off. After a few nights of doing this it made me wonder if other people do this. Are high ratings for shows that I don't like due to people just turning off their brains? Sometimes when I get home I don't always feel like following a story. I just want to be entertained. Have the networks known this the whole time? Being tired could explain the lack of story telling by the networks. They could be catering to the very tired working Joes at the end of the day. But what about others shows, such as "Mad Men" or "Game Of Thrones"? They tell stories every week and have a large following. Who do they cater to? Actually, they cater to the same type of people. I don't always feel like turning my brain off. There are days when I want to escape into a great story to escape the stresses of work and life. When I want to get into a story I've been watching "The Killing" on Sunday nights. Which I will give my review on as soon as I can. That shows that there is a place for story on tv. And I'm not always working, so I want to enjoy a well told story on my days off. What I'm saying is that I can understand turn off your brain entertainment a little better now, but still appreciate a good story now and again. I also fully believe that working for a living can effect what you watch. Just make sure not to work too much every body. Last year I quickly became fascinated with the tv show "The Killing". I had streamed the entire first season in the matter of a week and watched the entire second season every Sunday night. I was very happy with the show and couldn't have wished for a better crime show to get into. That was, until the final episode of season two. I was simply shocked by what I witnessed that night. Sadly, it was not in the good way. It baffles me that they could screw up a last episode that badly. I watched for 26 episodes, only to be slapped in the face at the last minute. 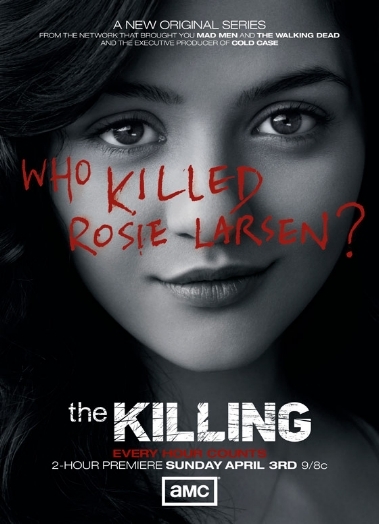 I waited for two season for the identity of "Rosie Larson's" killer. Only to be disappointed with the answer. The one I got wasn't the one I wanted. it felt like something that belonged at the end of an episode of "Law & Order". Not the end of a story that took two years to tell. At the time and point this episode aired, I had no idea that there was going to be another season. This seemed to be the end of the road. Talk of the show being canceled made that seem possible. At one point I heard that "Netflix" had picked the show up. This intrigued me because they have become the "HBO" of streaming services with their edgey programming style. That did not last for long. While watching the season three finale of "The Walking Dead" I saw a commercial for the third season of "The Killing". I have seen a few more ads for it since then. They have given me some interest in the show again. It will be nice to rejoin the characters that I enjoyed to watch grow, but I don't want to get burned again. This is the crossroads that I'm at. I would love to watch the characters and actors that I love again, but at the same time I don't want to be disappointed with a simple answer to a complicated question. This might the risk that I'm willing to take. You'll find out if it was worth it, when I give my review of the season premiere at the beginning of next month. I recently realized that most of these recommendations that I do on Wednesdays have been cartoons made within the last decade. I don't regret recommending these, but I think I should put the cartoons on hold for a bit and get into more live action fair. Today I'm going to talk about "Terminator: Sarah Connor Chronicles". A show on the long list of shows that got canceled while they were still in their prime. To be honest, I actually wasn't a fan of the show when it first started. When the commercials for it began to air, I had some interest in it. Yet when the time came to watch it, I didn't. The first episode that crossed my path was actually the season one finale. From then on I watched reruns starting from episode one that summer. It had exceeded my expectations just as much as the remake of "Knight Rider" had let them down that same year. I couldn't wait for season 2 to premiere. Little did I know it would be the shows last. "Sarah Connor Chronicles" in between the second and third films in the series, which is where the quality was as well. It wasn't as mind blowingly amazing as the second film, but not even close to as poor as the third. It did what it wanted to do very well, yet still couldn't touch the status of "Terminator 2". Believe me, that is a lot harder than it sounds. The show got you a lot closer to the characters than you were able to in the films. "John" and "Sarah Connor" had a whole new dimension added to them. They shared the screen a lot more than in the films and they felt more like a mother and son. Not to mention that the terminators were great in this show. "Summer Glau" is my favorite terminator of all time and "Garret Dillahunt" is easily my second favorite. I could go on and on about my love for this show, but I will spare you a ten page blog post. I can not recall a single thing that I don't like about this show. It was well written, well acted, plotted out with a stroke of genius. I don't know why you're still here reading this. "Terminator: Sarah Connor Chronicles" is now available on "Netflix" instant. Go watch, now!